Used in Residential and Commercial Applications. The high durability and resistance to bacteria and chemicals of the Pentek R Series filters is ideal for potable water, light industrial applications, swimming pool and spa, and well water applications. 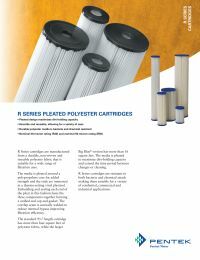 The pleated filter design maximizes the dirt-holding capacity and extends the life of the filter. Improved Filtration Efficiency. The core, filter media, and endcaps are embedded and sealed at each end of the pleat, forming a unified end cap and gasket. The overlap seam is sonically welded to reduce internal bypass, improving filtration efficiency. Surface Area: 16 sq. ft.